This is the only comparative compact aerostat trial ever done by the US military. It took place over a number of weeks in the Arizona Desert. Our 75m3 Desert Star Helikites won easily. The Helikites flew in higher winds, were more stable, tougher, easier to handle, carried payload better and flew higher than the competition. One interesting incident was related by the trials officers organising the test series: One day there were many dust-devils about. These are mini-tornadoes and can be quite rough. One moved onto a Helikite flying at about 400ft carrying a surveillance gyro-camera. The Helikite with its payload flew right through the middle of this dust-devil totally undamaged. The dust-devil then moved on to a competitive aerostat flying nearby and completely ripped it to threads. Smashed it to pieces – whilst it was being filmed from the air by the Helikite camera. Luckily, there was a government inspector present who saw it all. This is one reason numerous 75m3 Desert Star Helikite were purchased for US troops in Afghanistan. 34m3 and 75m3 Desert Star Helikites lift surveillance cameras to protect UK and US Forces from insurgents at Forward Operating bases in Afghanistan in dusty and difficult military conditions. They have a balloon cover made from special “Ultra” material that shields the balloon from dust, stones etc. Unlike “net-curtain balloons” such as Sky-Docs or Kingfishers balloons, that gather large amounts of dust and sand in their curtain sails leading them to crash, Helikites shed dust so they still fly well. Despite enduring high winds, dust storms, shrapnel from rockets and rough handling by minimally trained Afghan troops, all these aerostats are still in operation today. Unlike all any other small aerostats, Helikites will fly steadily in very high winds while still carrying payload. This is because Helikites have a huge steadying keel, stiff carbon-fibre spars, negative feedback weight distribution and a large kite sail. The proprietary solid carbon-fibre “Payload Attachment System” and “Steady-Cam Monopod” also allows cameras, wind-meters or radio equipment to remain steady, allowing excellent video, wind-data or radio communications even in bad weather. The video shows an 11m3 Skyhook Helikite flying steadily in a 50mph gale. 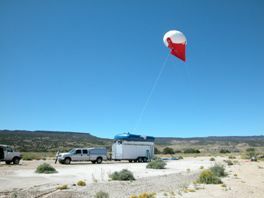 Aerostats designed in the USA or other continental climates may fly for months without encountering rain, so their designs and payloads tend to ignore the effects of prolonged rainfall. If these aerostats are taken from their normal benign dry home and flown in wet climates they may suffer very badly. 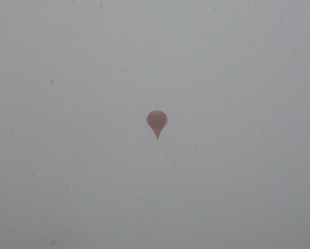 In contrast, an aerostat designed for wet England really needs to be able to deal with rain! Rain adds weight to all aircraft, so reducing payload capability. However, traditional long, narrow blimps are particularly vulnerable due to their large “surface-area-to-volume-ratio”. 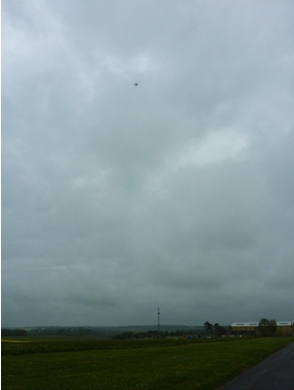 Helikites are far less vulnerable to rain building up on their surface because their rounded balloon has a much more favourable “surface-area-to-volume-ratio” meaning they are lighter when wet. This picture shows a 34m3 Desert Star Helikite flying at 1000ft above a 200ft “Cortez” surveillance mast at a UK British Army Base in the usual heavy rainfall. Helikite features that help them fly in dust and rain also help with snow. Snow does not often stick much to a flying Helikite due to the slight vibration of the flexible skin that shakes snow off. Also, as with dust, Helikites do not harbour snow anywhere in particular. In blizzards the aerodynamic Helikite is pushed up by the wind despite the snow. The photos show a 10m3 Desert Star Helikite being launched from a ship in the arctic during a whiteout. Conditions in which no other aircraft of any sort can fly. High humidity causes loss of lift because water vapour is less dense than air. Helikites fly fine in such conditions due to their excellent helium lift characteristics. 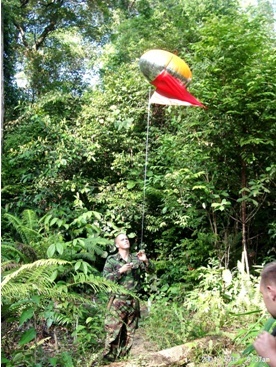 The picture shows a Jungle Marker Helikite flying being launched by the British Army to fly high above the jungle canopy in Brunei. 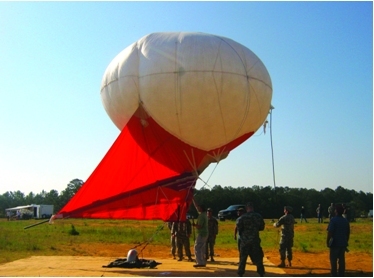 Hot air is less dense than cool air, so it supports less weight of aerostat. Helikites fly fine in hot countries due to their good buoyancy. 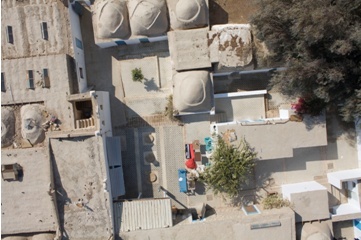 The picture shows a photograph of the ancient hidden city of Amarna in Egypt, taken by a 7m3 Skyhook Helikite operated by the Cambridge University Archaeology Department. 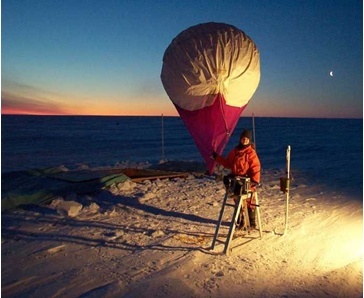 Cold air helps helium lift by being more dense than warm air, however extreme cold can also damage materials. Balloon materials may become brittle leading to damage when folding and ice particles may puncture balloons. Valves and tubing may break if not of high quality. The Desert Star Helikite is well suited to operating in extreme cold due to its protective “Ultra” balloon cover and Mil.Spec. valves etc. The picture shows a 7m3 Desert Star Helikite at Halley Base in the Antarctic. At high altitudes air is at lower pressure and therefore thinner and less able to support lighter-than-air objects compared to air at sea level. Helikites cope with high altitudes well, compared to traditional aerostats due to their excellent surface-area-to-volume-ratio. Also, the unique Helikite design eliminates the need for a heavy, power-sapping and cumbersome air-filled ballonet for high altitudes, thus saving weight. Allsopp Helikites Ltd can customise Helikites to be made even lighter if they are to be used at high altitudes. The picture shows a 34m3 Rapid Reaction Desert Star Helikite designed to provide communication relay to the US nuclear protection forces operating at a base altitude of 7,000ft in the high altitude desert of the USA. 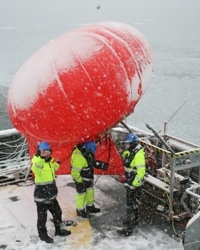 The maritime environment is an important place for aerostats to operate. There are no hills for radio relay or surveillance and there are many present and future uses for reliable, long endurance, high altitude platforms. Helikites are the only aerostats to operate easily and reliably at sea. Traditional sausage-shaped blimp aerostats need to be very large to cope with the high winds at sea - too large for practical use on ships. 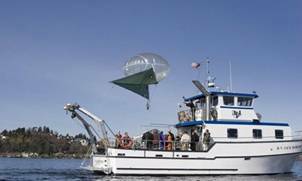 Other designs such as net-curtain balloons cannot cope with high winds, accumulation of salt spray, the turbulent winds found around ship superstructures or the side-winds associated with being towed behind ships or boats at speed. All sizes of Helikites, from tiny 1m3 Skyshot Helikites, up to powerful 100m3 Desert Star Helikites love being at sea. They are so stable that none of the above circumstances are a problem for Helikites. Helikites have flown from large ships at sea and small high speed boats. 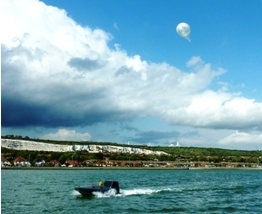 Helikites were the world’s first aerostat to have been successfully flown from an unmanned robot boat at sea. See top picture. The middle picture shows a 10m3 Desert Star Helikite being launched from a research vessel steaming in the Arctic Ocean, from which it can lift radio equipment or cameras. 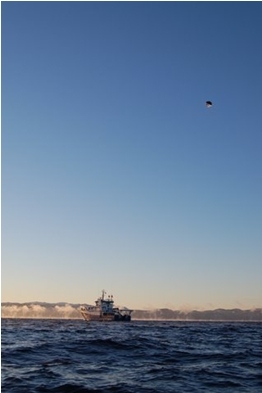 The lower picture shows the Helikite being launched.